Hawaiian Tropic Dark Tanning Oil will give you baby soft skin and a nice dark tan fast. The scent is like being in the tropics. If you want a fast, dark tan, this is your best bet. Hawaiian Tropic has a variety of products that pamper your skin and encourage a dark, lasting tan. I have used Hawaiian Tropic Dark Tanning Oil for over ten years. I buy tons of it every summer because I use it a lot. It is such luxurious tanning oil! It goes on really easy, it’s lightweight and it is a bit greasy but after all, it is oil. Once applied it lasts a long time and it does keep your skin hydrated and it is water resistant. I find that even after I shower the oil remains on my skin, not an oily residue but really soft skin. It is also fairly inexpensive and you can purchase it at any drugstore or retail shop, no need to purchase it at a salon. 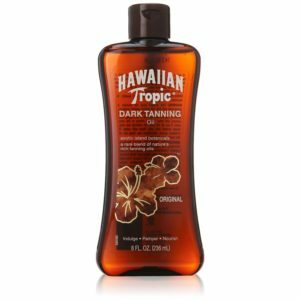 Hawaiian Tropic Dark Tanning Oil comes in its classic brown, plastic bottle with a tropical flower and Hawaiian Tropic written across the top. It’s also shaped so that it’s easy to grip. It’s an easy product to spot. Let me tell you how quickly I tan with this product…thirty minutes is all it takes to notice a bit of a golden tan. I don’t burn easily and I do tan fairly quickly so it may take someone with lighter skin longer to achieve a bit of color but not too much more time. Hawaiian Tropic Dark Tanning Oil does not contain sunscreen so it doesn’t protect against sunburn. I would really recommend using this product if you already have a bit of color so you don’t burn. As everyone knows, exposure of unprotected skin while tanning can have harmful effects even if you do not burn. If you would like a product with an SPF that allows you to tan and protect you against burning, Hawaiian Tropic Dark Tanning Oil Pump Spray has an SPF of 6. Although it’s a low SPF you just need to reapply often to protect your skin from burning. I not only buy Hawaiian Tropic Dark Tanning Oil for the great tan it gives me but also the delicious scent of coconuts. It smells like a sweet coconut drink. Yum! I can smell it all day it smells so good. This is my go to tanning oil for a deep, rich tan and soft, soft skin. This is 9 out of 10 in my book. The only reason I don’t give it a 10 is because it is rather greasy and I can’t wear it outdoors unless it’s at the beach.